Experience a winning blend of convenience and luxury at the JW Marriott Hotel Dubai. 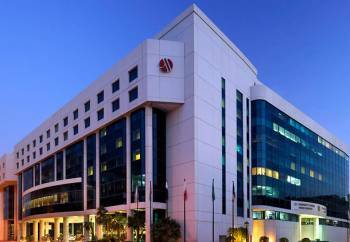 Located just to minutes from the Dubai International Airport, we offer travelers to the City of Gold 5-star accommodations and a central, accessible location. Reflecting the unabashedly opulent city of Dubai, our guest rooms and suites are equally as stunning; enjoy amenities like marble bathrooms, plush bedding and 24-hour room service. While our location is convenient to exploring such attractions as the Dubai Spice and Gold Souks, we hope you’ll spend plenty of time enjoying our comprehensive luxury amenities. Enhance your visit to the United Arab Emirates with a day spent at the Griffins Health Club, which offers guests a full fitness center, a rooftop pool, a sauna, and squash courts – and be sure to dine with us at one of our many on-site restaurant and bars. Whatever brings you here, know that the world is at your fingertips when you stay at the JW Marriott Hotel Dubai – we look forward to your visit.